Located right next door to the Drum Corps International headquarters in downtown Indianapolis, Ind., the Percussive Arts Society is preparing for the official opening of its brand new museum the "Rhythm! Discovery Center," on Saturday, Nov. 21. The organization will also have a "soft" opening of the new facility during its annual international convention which is taking place in Indianapolis next week, Nov. 11-14. 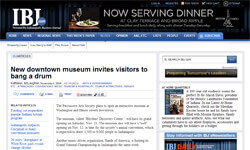 Read about the museum in the Indiana Business Journal.